23660 Alcaudete (Jaén)-Spain; Tel/fax: +34 953 56 00 66. Here you can see a video filmed by one of our US customers when they visited our mill. 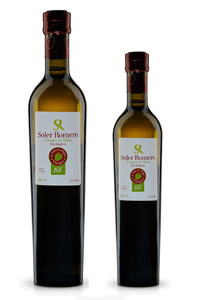 As an ideal complement to our olive oil, Soler Romero offers four varieties of delicious organic vinegars: balsamic, white balsamic, apple cider and Sherry vinegar. Secret of our vinegars is a combination of exceptional raw material (organic grapes and apples from Spain), the careful elaboration process with no addition of additives or sugar, and the ageing in oak barrels. They are produced following the ancestral method oxidation (fermentation) of wine and of grape must. 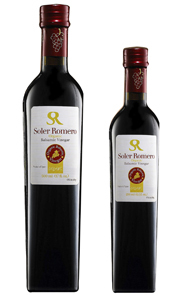 SOLER ROMERO organic vinegars rest for a long time in American and French oak barrels and thus becoming splendid vinegars. The aging of the vinegar contributes to the genuine character of each vinegar. The cellar with 600 oak barrels, which is probably among the most exclusive in the sector, allows us to produce unique vinegars. Depending on the time that we let the vinegar lay in the barrels, the oak will give the vinegar nutty, floral, citric aromas and aromas of toast, coffee and toffee. In the case of balsamic vinegar, oak aging gives balsamic tones as well as contribute to the concentration. Our vinegars are produced under quality standards and are certified organic by CAAE (European) and USDA. Ingredients are: wine vinegar and concentrated grape juice. The grape juice is heated until getting caramelized, and later it is blended with the wine vinegar. The final result is a dense, dark and brilliant liquid with velvety texture and a complexe flavour that is sweet and sour at the same time. 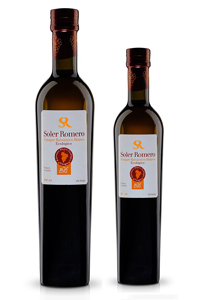 Soler Romero organic balsamic vinegar is very special due to its blends of sweet grapes like Pedro Ximenez and Malbec, and for the ageing process in Oak barrels for 5 years. Ingredients 100% natural and organic, we do not add any caramel or syrup, its natural sweetness comes from Pedro Ximenez and the cooked grape juice. Tasting notes: Rich, sweet vinegar with toasted aroma, caramel, coffee and signs of its long ageing in oak barrels. Persistent end. Creamy texture, balsamic colours. Acidity: 6%. It follows the same process as traditional balsamic vinegar, but the concentrated grape juice is cooked at lower temperature, without caramelizing into the dark colour of traditional balsamic. It is aged in oak barrels for at least 12 months. We find same aromas than traditional balsamic although it is less sweet and lighter in intensity and colour. Acidity: 6%. Thanks to its sweetness and aroma, both balsamic are ideal for salads, meat and fish dishes and for preparing different types of sauces. Our organic cider vinegar is the result of fermentation of only the best ciders from organic crops in Asturias, in Northern Spain. This is a product made with special sensitivity in which the consumer finds both a traditional as well as a young and fresh touch. Acidity: 5%. This vinegar is excellent for all kinds of salads and vegetables, fish, seasonings and marinades among others. Vinegar made of the fermentation of organic Sherry wine and aged in Oak barrels. Our Sherry vinegar is protected by the Regulatory Board of the Denomination of Origin "Vinagre de Jerez" . Elaborated in the province of Cadiz, southern Spain, its main grape is Palomino Fino, characteristic of Sherry wine. It is young vinegar, is one of the first organic Sherry vinegars existing in the market. Tasting notes: Yellow colour. Aromatic richness, traces of oak, old wine with a mild intensity, soft and well-balanced. Non aggressive, persistent aftertaste. Acidity: 7%.